Indian markets slipped further during this month, which was choppy for most parts, disappointed by falling industrial output, worsening fiscal deficit position and government’s rollback of its proposal to allow Foreign Direct Investments in Multi Brand Retail segment. Despite decent advance tax numbers, marginal moderation in inflation and RBI’s hint about reversal of hard money stance going forward, the domestic sentiments remained subdued pulling the benchmark Sensex down by about 4.14% in December. MSCI India was among the worst performers for the month as well as for the calendar year with a decline of 6% and 37.97% respectively as compared to MSCI EM (Emerging Markets) which dropped 1.29% and 20.41% respectively. The Rupee depreciation of over 16% against the US dollar in 2011 accentuated the adverse impact for India. The domestic mid and small cap indices continued to underperform the large caps by falling 8.75% and 8.97% respectively. Although FII’s were marginal net buyers of about USD 31.79 mn worth of equities in December, they have withdrawn about USD3.81 bn for the year as a whole. Alternatively, the domestic mutual funds have been net buyers in 2011 bringing in about USD 1.2 bn to the equities segment with USD 112 mn coming in during the month. Year 2011 is best characterized as an eventful year but mostly for the wrong reasons. Global Asset Markets squirmed as the sovereign debt issues in peripheral Europe snowballed into a full-blown crisis scuttling the global economic recovery process besides raising the specter of a double dip recession. Indian economy and consequently its markets were further hit by persisting inflation, multiple rate hikes and inertia in government policy making amidst a background entangled with periodical news of grafts and scams. Interestingly, all seemed well for the Indian Markets in the beginning of the year 2011. The indicator of Indian corporate performance, BSE Sensex, was near its peak levels of 20,000. Output of six core infrastructure industries such as finished steel, cement, crude petroleum, petroleum refinery, coal and power had recovered sharply after a moderate quarter. RBI had forecasted WPI inflation to drop to 5.5 percent by March 2011. Current account deficit as percentage of GDP was a manageable 3.6 percent. To top it all, India’s growth rate was projected to grow at an annual rate of 9+ percent overtaking China as the world’s fastest growing economy. With the benefit of hindsight, one would note that whatever could have gone wrong at the start of the year indeed went wrong in Year 2011. WPI Inflation remained at elevated levels of 9 to 10+ percent levels through the year on account of rising food, fuel and commodity prices despite RBI’s successive rate hikes (from 6.25% in January 2011 to 8.50% in December 2011) to curb demand. Slowdown in IIP, which was seen to be more of a short-term issue solvable by affirmative policy actions, turned out to be a long-run problem affecting national GDP growth and corporate earnings due to increase in input and borrowing costs besides government’s complete inaction on the reforms front. The monetary tightening did have an impact on inflation which started cooling off in November, however at the cost of slowing industrial and economic activity. Industrial performance deteriorated further during the end of the year and declined by 5.1% on yoy basis, due to contraction in manufacturing and mining activities, while capital goods witnessed a yoy decline of 25.5 percent. GDP growth for Q2 FY12 moderated to 6.9 percent from 7.7 percent in Q1 FY12. On the expenditure side, investments also showed a significant slowdown. Flow of foreign capital into the country which was in an uptrend during the first half of the year due to strong FDI inflows, rise in ECBs and trade credits, initially offset the sharp decline in FII inflows due to Euro zone debt crisis and concerns of double dip recession. However, as global risk aversion continued to build up and domestic markets continued to fall, flow of capital dried up considerably, widening the current account deficit further amid faster decline in exports than imports. Global concerns such as the European sovereign debt crisis, slow economic recovery in the U.S., political unrest in Middle East nations, and natural disaster in Japan were initially believed to have little impact on the Indian economy due to its domestically driven demand. However, there were significant indirect effects - spike in oil prices led to increased current account deficits. Accommodative monetary policies in Europe and U.S. which were rolled back in June 2011 adversely affected the global trade and capital flows. A combination of all the above problems discussed i.e. high inflation, burgeoning current account deficit, decline of capital inflows resulted in a massive 16+% fall in the value of rupee (from Rs.45 levels to Rs.53 levels) against the U.S. dollar. This in turn has considerably jeopardized the position of several Indian companies that have significant dollar denominated /linked debt in their books. The previous year turned out to be a nightmare with multiple domestic issues combined with slowing global environment. What is worrying is the fact that the growth deceleration could spill over into 2012 and perhaps beyond. As per reports, global growth is expected to slow from 4.2% in 2010 to 3% in 2011 and to 2.5% in 2012. Considering the false start of FDI in retail and populist measures like Food Security Bill, the domestic policy prospects for 2012 don’t appear good. Last year, we were discussing about double dip in US economy and possibility of India’s growth overtaking China. Ironically, today the U.S. is doing satisfactorily and the hot topics are ‘Fiscal Integration in Europe’ and who will slow down more, between India and China! Although USA may not recover significantly, the recession talk has vanished. European banks will continue to take a hit on their balance sheet owing to their exposure to sovereign debt. Whether it is a ‘default’ or a ‘managed default’, credit shortage could become a handicap for growth in EU region. In India, the government has to battle on many fronts. The first half of 2012 will see concerns about a slowdown gaining prominence over peaking-off inflation. Most of the leading economists have already revised down the GDP forecast for India to 6.7% for FY12 and 6.6% FY13, well below the government guidance of 7.25%. This reflects the impact of higher interest rates resulting in slowing investment demand and global uncertainties affecting export demand. 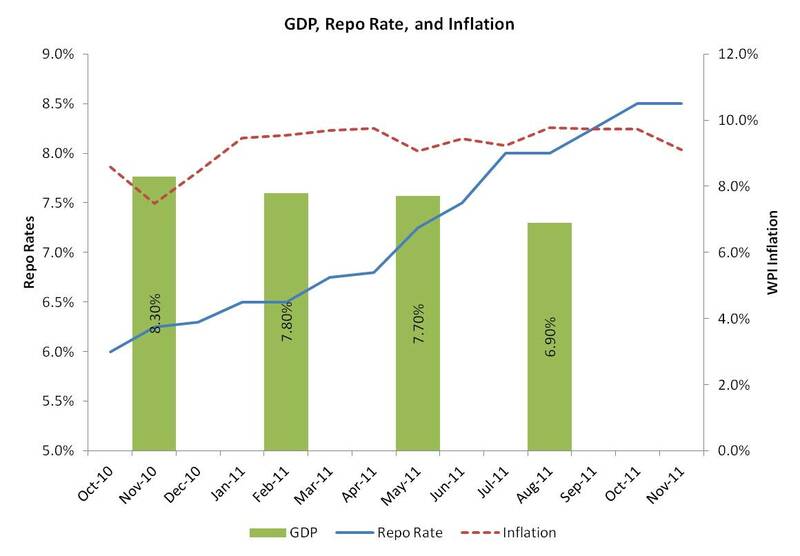 We expect the growth rates to bottom out in middle 2012 on account of rate cuts and base effect. We also expect the RBI to cut rates by around 200bps in Q2-Q3CY12. At this juncture, inflation is likely to peak off in early 2012. However, with five states going in for elections in March ’12, we will not be surprised to see price hike in Kerosene, diesel and LPG post-elections. Further, possible price increase in coal and power tariff cannot also be ruled out. These measures will once again stoke the inflation up, testing RBI’s policy stance. Any adverse global economic developments are obviously not in our control. What’s more disconcerting is the fact that Indian government has severely fallen short of expectations on the reforms agenda. The problems are well-documented starting from coal shortage to policy paralysis, fiscal slippages and multiple scams. We don’t have any big hope on the reforms front as any related impact on the economy comes only with a lag. However, we do hope and feel that the government would be able to manage the fiscal issues without disturbing the rates as slowing economy will pull down the loan demand. Prudent fiscal management coupled with some determined policy decision-making from the political class could help the economy bounce back with a growth rate of around 8% at least in FY 2014 if not earlier. Cyclical deceleration in growth and policy inertia are the key drivers for the current slow-down in India. Unlike 2008, the problems now are home grown and hence domestic market benchmark indices underperformed their developed as well as emerging counterparts. Mid and Small cap Indices witnessed a steeper sell-off compared to large caps. The sell-off was also broad-based with all the sectors except FMCG closing in the negative territory. Real Estate, Metals, Power and Capital Goods were the top losers amidst concerns of slowdown in investment activity and coal shortages. Trading volumes in equity market is presently at five year low and still declining. The current bear market has sustained long enough and we have to look out for reasons that can cause a turnaround. As explained earlier, consensus is also concerned about macro signs with fiscal, current account and rupee spiraling out of control. Most of the domestic funds and insurance companies are a tired lot with no fresh inflow of funds. Although Indian markets look attractive based on P/E multiple, considering the amount of earnings downgrades the PEs may be higher than our current belief. While markets could rally on rate cuts, the sustainability would depend on investment spending and policy reforms from capital. As we go in 2012, though the macro picture looks weak, we will probably see raw material prices moderating on the back of a slow-down in China which in turn would help India Inc to improve their gross margins. Interest cost will peak in next couple of quarters that would help driving below-the-line profits. In other words, considering the below-expectation profits for December and March quarter, the base effect will provide some sense of optimism that earnings can surprise on the upside during the later part of 2012. Right now, “it’s so bad, it’s almost good”.